I am deeply convinced of the need for some inspiring photos or situation to carry you through the doldrums of training that all of us eventually experience. Photos of most of the top physique stars have adorned my walls at one time or another. Reeves, Grimek, Ross and Degni, plus others too numerous to mention used to stare down at me from my wall, urging me on to further and greater efforts. They were a constant reminder – this is what I want to look like, this is what i’m striving for. This, then, is essentially the purpose of these shots, to give you that added training boost when you need it. And, I want to thank you for choosing me as one of the sources of inspiration. 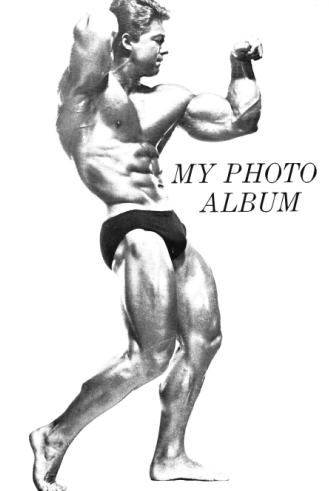 The photos were taken the day after I had annexed the Mr Universe title in New York City, September 20, 1964.